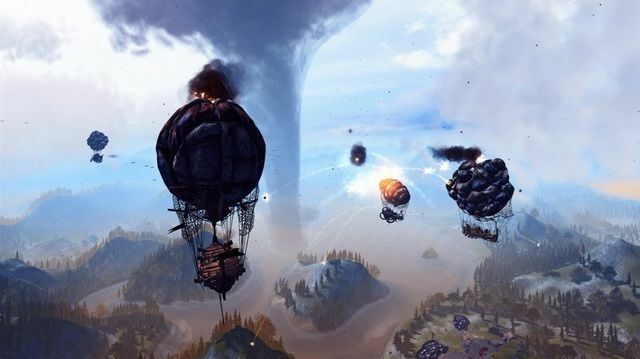 If last year you approached me to say you had an idea to create a game where you pilot hot air balloons which are loaded up with cannons, rockets and flamethrowers I would have to say my interest would have been piqued. Throw in persistent character leveling, hilarious taunts (you really have to hear these to believe them), ship boarding, round it all out with two opposing forces of vikings and pirates and I would have told you to shut up and take my money! Thanks to Steam's GreenLight service this is exactly what happened when gamers united to give LudoCraft Ltd the go to release their fantastic fantasy balloon battling title, AirBuccaneers.AirBuccaneers originally was conceived back in 2004 as a mod within Unreal Tournament III during Epic's "Make Something Unreal" contest. Now almost ten years later a new and improved standalone version has graced my PC's hard drive and I have to admit to you I'm completely hooked! 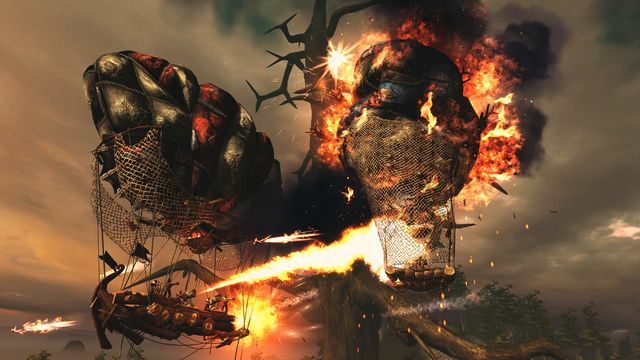 There is just something so mind-bogglingly satisfying about taking to the skies in a hot air balloon of death and watching your enemies plummet to the ground in a fiery blaze after a hail of cannon fire. Original Unreal Tournament III screenshot. The game, while simple in premise, offers enough diversity to keep you occupied for a long time. Once you've selected your side, Viking or Buccaneer, you're thrown into a match and set off on your conquest to destroy your opponents and their ships. There really isn't any ground combat to speak of here, unless your enemies somehow manage to get close enough to your base to spawn camp you, so expect to spend practically all your time upon one of AirBuccaneer's four available ships. The fragile Kamikaze ship that explodes on impact. 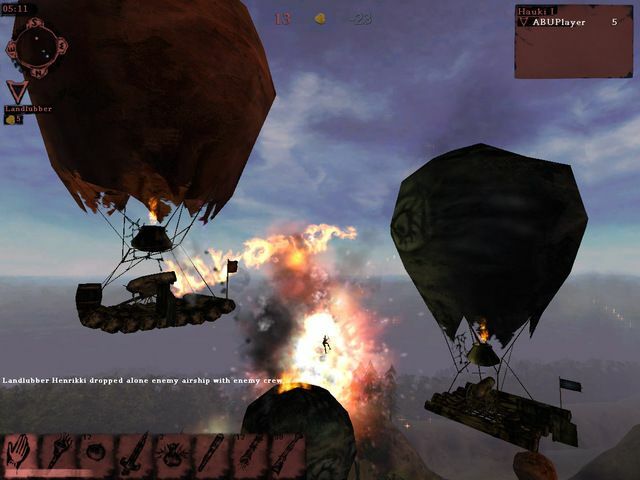 A balloon with no cannons who's pilot must maneuver through enemy cannon fire in order to bring down other balloons with a single blast. Generally piloted by a single player, although some brave souls may attempt to catch a ride with you leading usually to hilarious results. The single cannoned Cog ship. A small balloon usually reserved for two, helmsman and gunner. The mighty Battleship. This larger balloon, which I like to refer to as the "Party Boat", comes complete with a total of four cannons. A competent and complete crew can make this ship a force to be feared! The Flying Fortress. This huge floating island ship has three absolutely huge and devastating long range cannons. Unable to move unless using the "boost" ability, this ship is tricky to pilot and deadly when positioned properly. Yeah, I call it the "Party Boat" for a reason! AirBuccaneers is best played as a team game, and attempting to take on your enemies alone is almost always a recipe for doom (unless you're "that guy" who always takes the Kamikaze!). You'll need to coordinate with your team to make sure your balloon is manned properly. What good is your balloon if you don't have someone to fire the cannons as you fly? How are you going to keep your ship in the air unless you have a pal swinging his support staff (which I jokingly refer to as the "baby rattle") away to repair your hull? Those incoming cannonballs and air mines are going to put a hurt on you unless you have someone using their musket to knock them away! 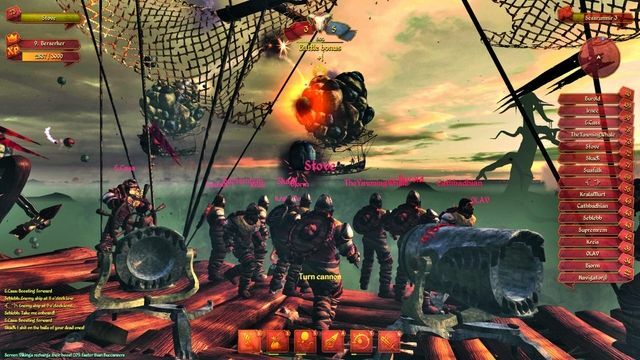 Feel like hopping off your balloon to attempt to board an enemy ship? Go for it! There are multiple roles to fill and they're all extremely important to your success. Thankfully the game rewards players with experience depending on the role you've been filling (Helmsman, Gunner, Support). Featuring a large skill tree that unlocks both Perks and Flaws as your fulfill your duties will keep you coming back again and again as well as encourage you to try your hand at each of the three roles. I really enjoyed this system of Perks and Flaws as it becomes a tradeoff of sorts for your abilities. Want to be able to pilot your balloon faster? Be prepared to take a Flaw also, like being a drunken sailor that erratically moves your balloon in various directions at the most random of times! It's a great idea and often times leads to hilarious results. More often than not my drunken Viking gets sucked into that damn maelstrom! I really only have two complaints about the game which are mostly minor detail stuff that hasn't really detracted from my experiences. The more major of the two is something I expected slightly considering this is an indie title. Occasionally they're just not many people playing the game. This makes choosing a server when you start something of a no-brainer and always going with the most populated one, although this tends to be a European one (Always Ireland it seems for me!). I haven't encountered really any lag so to speak that has hampered my gameplay, but it would be nice to have more options. The second complaint is the melee combat. Boarding enemy ships is something that absolutely without a doubt happen to you, and mastering the sword has been a problem for me. There isn't any hit detection feedback that I've noticed, like staggering your opponent or even being able to tell if you hit your foe or not. This leads to furious clicking of the mouse and fumbling around your ship. More times than not I get killed by this as I'm trying to pilot my balloon and I've learned that an enemy boarding my ship is a death sentence for me. For this reason I always try to keep my distance and rely on my ship's weaponry (although getting in close to unleash my flamethrowers is tempting!). AirBuccanneers is beautiful, hilarious, crazy and an incredible amount of fun for an indie game that is basically a rehash of a ten year old UTIII mod. It's not perfect, and no game is, but I'm going to continue to bark orders at my crewmates for many months to come! *edit* Now I just need to add images later when I'm not busy with work. Wanted to at least get this up this morning. Great review Chris. This has been in my sights for a while now, and I am going to go ahead and pick it up today. Let me know if/when you want the article published to the front page. I will definitely want it published. I do need to add images into the review later this evening when I get home from work and before I start streaming imgur and other sites don't like to behave with my corporate firewall, so I have to wait. All finished up with screenshots. Please post it up to the main page if you don't mind Dat. Thanks so much. Let me know when it's done so I can let Olli and the people from LudoCraft know! Sorry for the delay. The problems with the site held me up. She's posted on the front page now. No worry for the delay. Thanks again man.